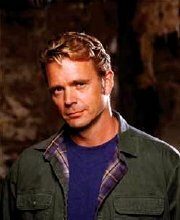 John Schneider was born in upstate New York in 1960, and began acting at the age of eight. When he was fourteen he moved with his mother (his parents had divorced in 1962) to Atlanta, Georgia, where he became involved with the local theatre and appeared in many of their productions. of them. In the series, Schneider performed many of his own stunts, including driving. family comedy film Collier and Co.: Hot Pursuit! (2006). A sequel, Collier and Co.: High Octane is scheduled for 2009. 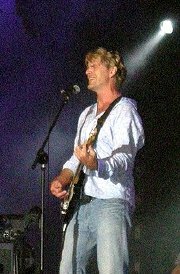 Schneider is also an accomplished singer, guitarist and song-writer. He sang several duets with his co-star Tom Wopat in The Dukes of Hazzard. He has released eleven solo albums, had 'top-ten' singles and performed in many Broadway shows such as the award-winning musical Grand Hotel. Nip/Tuck (2007-08). His most recent TV series appearance has been as Marshall Bowman in 15 episodes of The Secret Life of the American Teenager (2008-09). Recognising a need for better child health care, Schneider co-founded the Children's Miracle Network, an organisation which raises billions of dollars for 170 children's hospitals throughout North America. 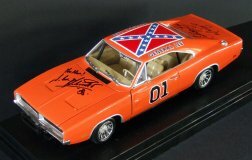 From his Dukes of Hazzard days, Schneider retains his love of cars and has restored many 'General Lee lookalike' Dodge Chargers. He also has an impressive collection of classic cars. 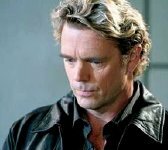 John Schneider is married to his second wife Elly, and they have three children, Leah, Chasen and Karis. 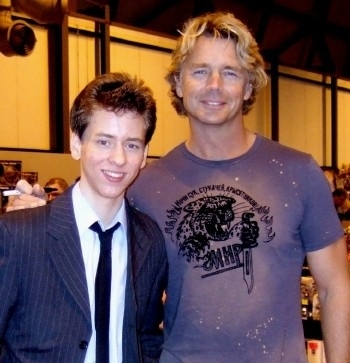 I met John Schneider in November 2007 at the Birmingham NEC, where he was appearing at Memorabilia. 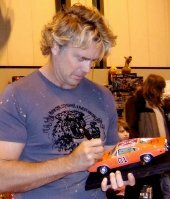 John signed a photograph from The Dukes of Hazzard, and also my model of the Dodge Charger known as 'General Lee' in the series.